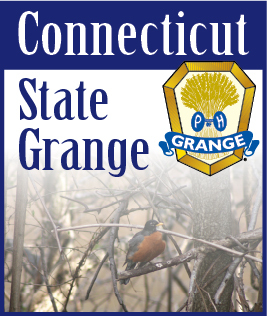 The Connecticut State Grange family extends it's deepest condolences to State Grange Overseer Jody Cameron, State Pomona Jodi Ann Cameron, and their family on the passing of devoted Granger, Barbara Cameron. Barbara Irene Cameron, 75, of 21 Grove Street, died March 6, 2010 at UMASS Medical Center after a courageous battle with cancer. She was born September 27, 1934 in Norwich, the daughter of the late Jesse and Viola (Bennett) Warren. She was the wife of Charles Chester Cameron Sr., who died November 18, 1998. Barbara enjoyed knitting and crocheting, making many lap robes for convalescent homes and hats for newborn babies for the area hospitals. Her handwork won numerous awards and trophies at the Brooklyn Fair and in Grange Competitions. She was a member of Ekonk Community Grange #89, Quinebaug Pomona Grange #2, the Connecticut State Grange and the National Grange for over 35 years. Survivors include daughters Catherine Vegiard and her companion Bryan Lamoureux of Wauregan, Ellen McGrath and her husband Christopher of Putnam, Viola (Bumm) Brown and David Hunt of York, PA; sons, Robert Warren of KY, Charles C. Cameron Jr. and his wife Catherine of Fort Smith, AR, Nelson Cameron and his wife Barbara of Sterling, AK and Jody A. Cameron and his wife Jodi Ann of Moosup; stepdaughters, Peggy Baker, Charlotte Birchmore, Sheila Turpin, and Cynthia Cameron, all of VT; grandchildren, Bobby, Faylene, Patrick, Crystal, Christian, Sherri-Nae, CJ, Tobias, Ronni, J.R., Kyle, J.Allen and Jaimie, 11 step grandchildren and several great grandchildren, Her brother Frank Warren and his wife Jeanette of Brooklyn; sisters, Betty Heath and her husband Glen of Grosvenordale, Ella Rondeau of Dayville and Jesse Auclair of Danielson, and several nieces and nephews. A Graveside Service will be held at 10:30 A.M. on Saturday, March 13, 2010 at the Connecticut State Veterans Cemetery, Middletown, CT.
A Memorial Service will follow at 12:30 P.M. at Ekonk Community Grange Hall, 723 Ekonk Hill Road, Sterling, CT. There are no calling hours. In lieu of flowers memorial contributions may be made to the Ekonk Community Grange, Building Fund, c/o Susan Gray, Secretary, 712 Ekonk Hill Road, Moosup, CT 06354. Tillinghast Funeral Home, 433 Main Street, Danielson is in charge of arrangements.